The largest city in the south of Europe, we always recommend visiting the vibrant capital of this Andalucian province. 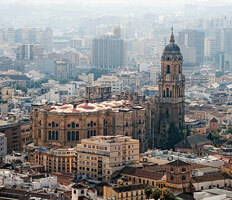 Malaga enjoys a subtropical climate with one of the warmest winters in Europe and an average day temperature of 17ºC. For more about the Malaga weather click here. The history of Malaga dates back about 2700 years - when it was founded by the Phoenicians in about 770 BC (who called it Malaka) - which makes the city one of the oldest in the world. When arriving at Malaga Airport, you are only a few minutes away from Malaga City. Malaga Airport Transfers offers personalised tours, excursions and day trips to Malaga at unbeatable rates. Shopping, walking, relaxing, dining, visiting monuments and museums... all these things (and more) make for a great day trip on the Costa del Sol.. 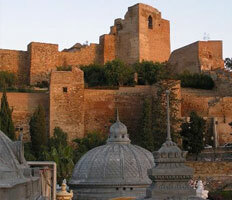 The Alcazaba: a royal residence and fortress connected to the Gibralfaro, a castle built by the Moors; both date back from the 11 century. 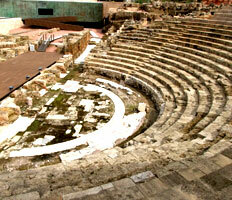 Roman Theatre: one of the city's oldest architectural remains, it dates back to the 1st century BC. Malaga Cathedral: a Renaissance church, laid out on a rectangular plan composed of a nave and two aisles. The interior is also in a Renaissance style, and is filled with series of artworks. 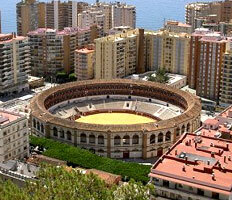 The Bullring: here you will also find the bullfight museum, Museo Taurino Antonio Ordoñez. Malaga Harbour: one of the most important ports of Spain. The New MUELLE UNO: an extraordinary pier next to the port of Malaga, it was renovated and opened in March 2012 and is full of shops and restaurants in a unique and beautiful location. Church of Santiago (St James): its style is based on two artistic moments of great importance - Gothic-Mudejar - and incorporates elements from both Christian and Islamic traditions. The Mountains: visit the nature park "Montes de Malaga", and, just outside the city, the pretty Botanical Gardens of La Concepcion. Shopping and entertainment: the Plaza Mayor and commercial centres like Vialia, La Rosaleda, Nostrum are a few great places to go shopping, watch a film and grab a bite to eat. 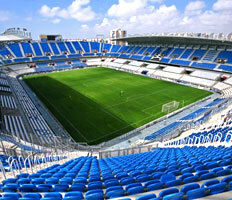 Malaga Football Club: founded in 1904, its stadium is called La Rosaleda. 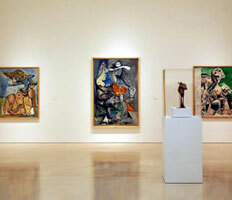 The Picasso Museum: here you can find over 150 artworks by the artist Pablo Ruiz Picasso. The museum was merged with the "Fundacion Museo Picasso in Malaga", which is based in the home of Picasso (where he was born on 25th October 1881), and is now called the Museo Casa Natal (Birthplace Museum). The Carmen Thyssen museum: this new art gallery was inaugurated on March 24th 2011, and situated in the centre of the city. Without doubt this is one of the best museums in Malaga. CAC Malaga: the superb Museum of Modern Art which sits on the banks of the river. Interactive Music Museum: is home to an enormous collection of musical instruments, many of which can be played by visitors. Like the sound of Malaga and thinking of paying it a visit? Use the form in the top of the page to find out our prices on cheap airport transfers to Malaga from the airport. Starting your holiday simply couldn’t be easier.